Good and affordable 1 bedroom apartments are hard to find. Until you find Siegel Suites. Our large, furnished and unfurnished one-bedroom apartments offer you convenient locations, surprisingly cheap rent, and apartment amenities that you’d expect to pay a lot more for – like free premium cable TV, free utilities, swimming pools, laundry facilities, and more. And we make it easy to rent your 1 bedroom apartment with no long term lease, no long-term commitments, and bad credit ok. 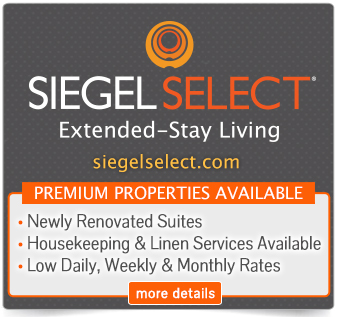 Call us at 1-888-328-0192 to rent a 1 bedroom apartment at Siegel Suites today!